JongPuzzle is the mah jongg - like tile solitaire game for Windows. It is a fun puzzle game like mah jongg, that tests your mind. Its intuitive interface is very easy to learn, and you will be playing within a few minutes. The goal of JongPuzzle is to remove all of the tiles from the game board. Tiles can be removed only in pairs and must be free on their left or right side or on their top or bottom, so you can connect them three or less lines. You need only the mouse to play. Move it to aim your launcher, and click to launch your tiles. There is no time limit in JongPuzzle, so you can play as quickly or as patiently as you wish. unique tile layouts (ranked from 8x18 to 20x16). 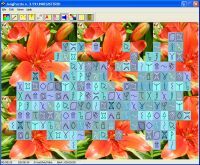 9 original thematic tile sets (Egiptian, Signs, Fractal, Easy). Fun and engaging sound effects. JongPuzzle lets you save games in progress. 1. You have recive notify dialog. 2. You have accessible only 3 levels. Fixed bug in quick saving and loding.